Editor’s note: Michael A. Denner, Ph.D., Stetson professor of Russian, East European, and Eurasian Studies, returned this month from a sabbatical that included a trip to Ukraine, where a three-year war with pro-Russian Ukrainians has left 10,000 people dead. 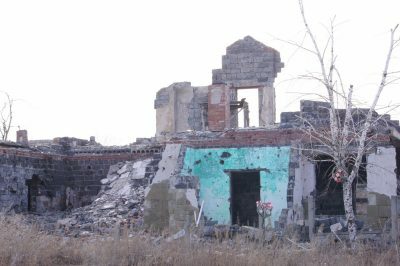 In this article, Denner writes about the war and describes a side trip to Sloviansk, Ukraine, with former Stetson professor Mark Powell. There is war in Ukraine. Most Americans are unaware that, for the first time since war dismantled Yugoslavia in the 1990s, Europe is the site of an active military campaign pitting the Russian military (or, more exactly, pro-Russian Ukrainians actively supported by Russia’s military) against the Ukrainian military. The war originated in the pro-Western Maidan protests of 2014 that led to the removal of the corrupt but legally-elected TV villain Viktor Yanukovych. But the trail of consequences that leads from downtown Kiev in November 2013 to today’s stupid, pointless war in the country’s industrial eastern haunch? No one I talked to recalls the details any longer. War has become the reality. When necessary, when Russia needs some misdirection or leverage, when it needs to distract the West from some other malefaction it is machinating in Syria or Libya or Georgia, or within its own expansive boundaries (usually involving Polonium), it fiddles with the knobs on the range, turns up the flame a bit, jostles the saucepans and… A full-scale war, with missiles and exploding aircraft and gore and stupid, bloody, snowy tragedy, appears once more on the international table. Over the past three years, during these flare-ups, around 10,000 people have perished. … or at least the pro-Russian separatists. sounds like interesting times over there. Wheeee! Anyway, this is clearly Ukraine baiting the bear… It is SUCH A BAD IDEA. Lots of crowds outside the volunteer recruitment centers… The Ukrainians are a wonderful people, but they are horribly outgunned by the Russians. I don’t know where they go from here… If they resist, Russia will grind them out. If they antagonize, Russia will seize the chance and run over them like it did the Georgians back in 2008 or 1992. And who’s to prevent them, who’s going to stand up for international laws and agreements? Not Europe. Not the USA. I really don’t know where this goes from here. But the one thing that Ukraine should not do right now is to antagonize the Russians, making a desperately bad situation even worse. Sigh. could this be Russia trying to foment justification for really rolling over Eastern Ukraine? I can imagine them taking all the territory they want, then holding a referendum where “the vote” is overwhelming for annexation. which would leave the door open for Trump to justify lifting sanctions. then the question is: does Putin go into, say, Estonia or Latvia too? Why stop there? Hey, Finland was part of the Russian Empire! Mark has been working on a long novel, a pot-boiler about Ukraine and spies and … well, a lot of other stuff. He left Stetson last year for a new gig at Appalachian State University. But while he was here at Stetson, Mark and I met every Monday, Wednesday, and Friday at 8 o’clock to lift weights in the Hollis Center. We always talked about fiction, Ukraine, and international conflict between sets. Mark had never been to Ukraine but was writing a novel set there. I was going there on sabbatical. At some point we decided he’d come to Kiev and we’d visit the occupied territories. But, how does one visit a war? I made some calls and sent some emails: I needed to get to Donbas. Everything in that part of the world works on blat, a word in Russian that means … well, it means blat. It means you call a friend who owes you a favor or wants to do something kind for you, and he calls his friend who owes him a favor, and that friend calls … It’s good to have friends in Ukraine! Eventually, I added a fixer in Sloviansk to my Facebook friends and started planning the trip eastward to Donbas. Slóviansk (Слoв’янськ) is about 150 kilometers from Kharkiv (to the north) and Luhansk (to the east), the cultural and political centers of Donbas. The Russians call the city Slaviánsk (Славянск)… The spelling and letters are very important! The city is, tactically, the closest position that Ukraine holds to the occupied territories in Ukraine, and it was also the focus of the early stages, in the spring and summer of 2014, of the war in Ukraine. Politically, Sloviansk is the easternmost city where the majority of the population self-identifies as Ukrainian. And a fixer… a fixer is someone, usually ex-mil, who solves problems for international aid agencies working in warzones. The fixer is the guy — it’s almost always a guy — who makes sure you don’t get killed in the war. Stetson Professor Michael Denner traveled to Ukraine in spring 2017 as part of his sabbatical. Mark arrived in Kiev with his photojournalist buddy, Pete Duvall, in tow. The next night we set off for Sloviansk on an overnight train that could have been built in 1955 or 2015… it’s hard to know in Ukraine. 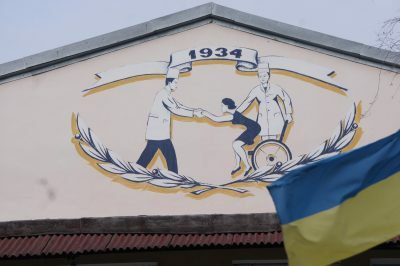 Like so many places on the periphery of the former Soviet empire, nothing had changed much in Sloviansk since the end of the Soviet empire in 1992. It was monochromatic shades of grey, dusty, full of rubble, sunflower stubble. The flat landscape, pitted with brackish ponds and thrushes, had been a salt-mining region in the eighteenth century, nothing much in the nineteenth, and a vibrant manufacturing hub during the Soviet century. In the twenty-first century, it’s returned to nothing much. Everyone who could leave, left a long time ago for Kiev and western points beyond. People there cobble together livelihoods from odd-jobs in the few remaining factories and their kitchen gardens. Think southern Ohio with Ladas. Peaceful enough, the only signs of war there are the mortar scars and frequent roadblocks manned by young soldiers carrying AK-47s. We spent a few days in the back of Yuri’s taxi. He took us to all the “top secret” places where the Ukrainians were hiding stockpiles of missiles and heavy tanks, in contravention to the Minsk Accords signed by Ukraine and Russia in 2015. 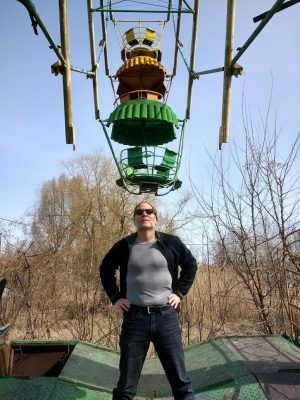 We found an amusement park, built during the Soviet era but now forgotten and eerily rusting out of existence. We stopped at the point on the highway where an Italian journalist had been killed, and gazed at the crash site of a Ukrainian military helicopter, shot down by pro-Russian forces in 2014. We toured the city administration building, made famous when, in 2014, the Vice journalist Simon Ostrovsky was taken into “protective custody” there by Russian punks posing as politicians. We surveyed roads and roadside houses pitted by mortar shells. 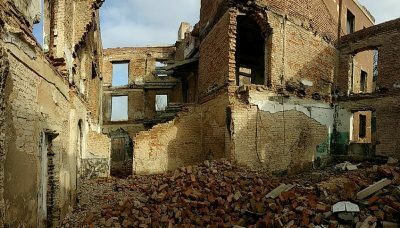 Most memorably, we wandered through the ravaged ruins of a durdom complex, three buildings that had served as an insane asylum until, in the summer of 2015, the pro-Russian insurgents had retreated there, and been blown to bits by Ukrainian special forces and, apparently, a helicopter or two. 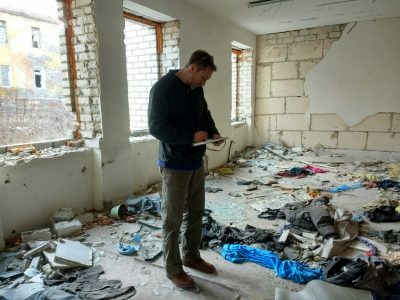 Former Stetson professor Mark Powell takes notes in the bombed out remains of a psychiatric hospital in Ukraine in March 2017. This being a fully modern war, we ended our days with nights in the Taler bar, drinking excellent local brew, eating lamb kebabs, and chatting with munitions experts from Europe who were there demining the sunflower fields. War, in all its stupidity, leaves behind mostly rubble, Mark observed. War is messy, it accelerates entropy, the falling apart of things, leaving behind first horrible carnage and then just numb bleakness. It was obvious to us that war in Ukraine was just abiding, waiting until some opportune moment to first flicker, then flame, then rage. Michael Denner, Ph.D., is the director of the Stetson University Honors Program, professor of Russian, East European, and Eurasian Studies, and editor of the Tolstoy Studies Journal, an annual refereed journal. Former Stetson professor Mark Powell also wrote about this trip to Sloviansk, Ukraine, for the Daily Beast. Powell’s latest novel is Small Treasons.